Season the beef with kosher salt and transfer to a large plate. Refrigerate, uncovered, for at least 12 hours or up to 24 hours. Bring to room temperature before cooking. Meanwhile, in a large colander, toss the tomatoes with 1 teaspoon of kosher salt and let stand for 30 minutes. In a medium saucepan, bring the vinegar, sugar, 1 tablespoon of kosher salt and 3 cups of water to a boil, stirring to dissolve. Add half of the tomatoes and simmer over moderately low heat until they start to soften, about 3 minutes. Using a slotted spoon, spread them on a large rimmed baking sheet to cool. Repeat with the remaining tomatoes. Discard the brine; wipe out the saucepan. Preheat the oven to 225°. Pat the beef dry with paper towels. In a large skillet, heat the canola oil. Cook the beef over moderate heat, turning, until browned all over, about 8 minutes. Set a rack in a small roasting pan and place the beef on it. Transfer to the oven and roast for 1 1/2 to 2 hours, until an instant-read thermometer inserted into the center of the meat registers 120° for medium-rare. Transfer the beef to a cutting board and tent with foil. Let rest for 30 minutes. Discard the string and thinly slice the roast beef against the grain; transfer to a platter. Drizzle with some of the tomato oil and sprinkle with flaky sea salt. 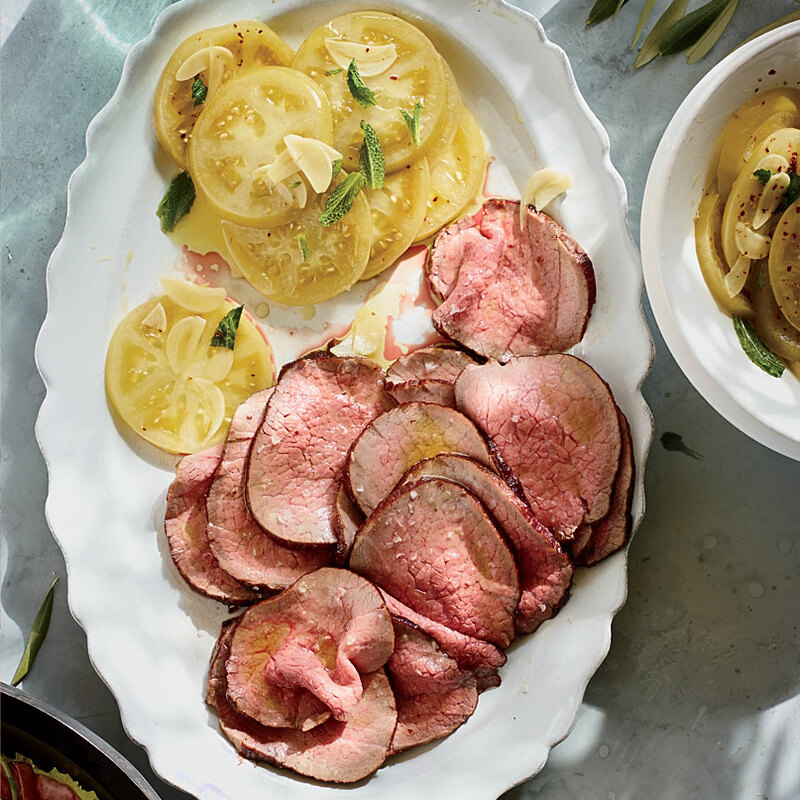 Serve the beef warm or at room temperature with the pickled green tomatoes. The pickles can be refrigerated for up to 1 week. Review Body: This roast beef pickled is delicious! !